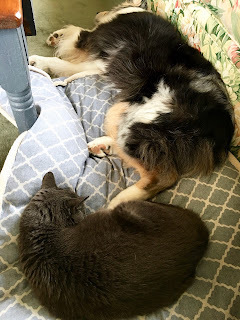 LUCY BURDETTE: Thirteen years ago, we lost our elderly Australian Shepherd, Poco, along with two cats, all within six weeks. John likes animals but can live without pets, so we tried living pet-free for four months. I was miserable. The house felt so empty and lonely. I included a note in our Christmas letter about our missing animals and that same week got a note back from the Australian rescue friend who had arranged for us to adopt Poco. “I think I have just the dog for you." I explained this to John, who could only roll his eyes. "She said I could just go meet him, and we could even take him for a trial couple of days." More eye rolling. He knew better. On the way home from picking up Tonka, I stopped at John’s office. "Come see what I have out in the car, honey." Tonka sat in the passenger seat appearing confused but determined. We never looked back. 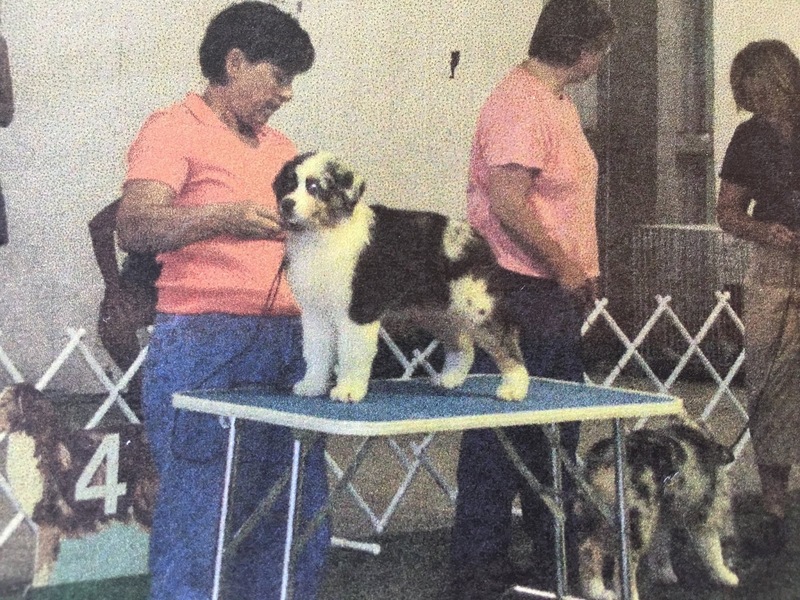 He had been the pick of his litter, destined to be a show dog. 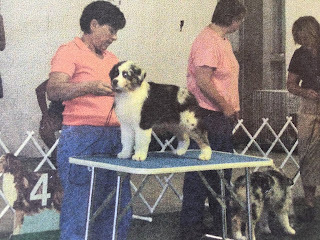 Here’s what he looked like as a puppy before we knew him, and in his first dog show. Killer cute right? But his teeth came in wrong and he turned out to be a little tall for the breed standards, so the breeder needed to find him a home. And we got lucky. He bonded intensely to me from that first day. Some days John didn’t remember that we had a dog because Tonka was always at my side, under my desk, running errands with me, even doing yoga. We considered him something of an ambassador to non-dog lovers. He would find the least dog-loving person at the table and lie at their feet--or on them. He didn’t convert everyone, but lots of people who didn’t love dogs before they met him were enchanted. Hallie, one of those people, described him as "A person in a dog suit." He always wanted to make the travel team, and he usually did. Of course he made it into my author photo. He was a a rockstar in Key West, as you can see from this photograph, taken by Hallie's husband Jerry. 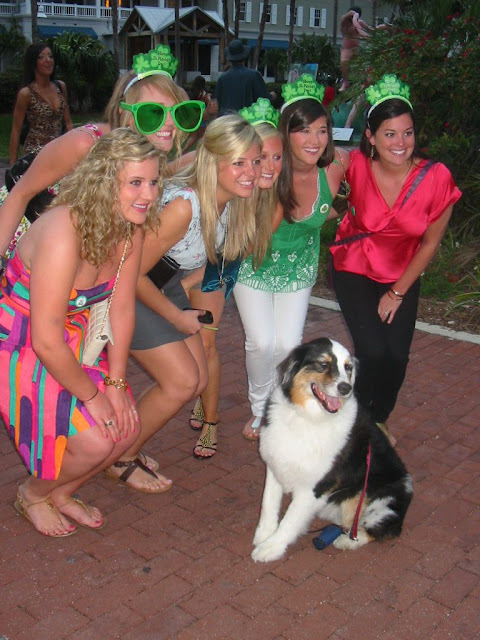 When we walked through the streets of Key West, our guests would be astonished at how often we were stopped so that people could admire him, ask questions about him, and get a dog fix because they missed their own. 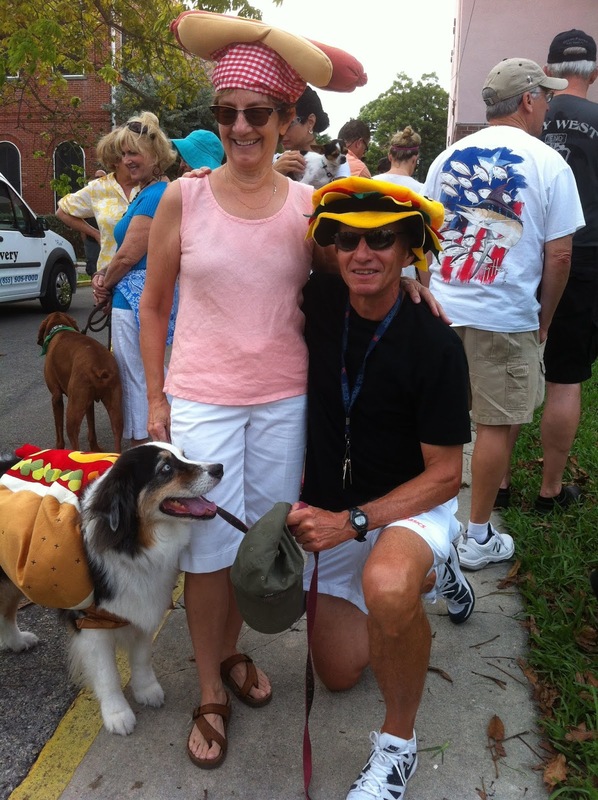 He put up with the Key West costume scene, including masquerading as a wiener dog in the dachshund parade and wearing a tutu for Fantasyfest. Oh he wasn't perfect--he had more energy than we knew what to do with. We washed out of agility training because he was afraid of heights. He shook so hard on the balance beam that he fell off--in spite of the hot dog treats ahead. So John ran with him, and I walked. If you stopped to chat with a neighbor on a walk he would spring four feet in the air and nip at you. Time to get a move on, we're walking. And he was not a fan of children, especially toddlers. He tolerated the cat only because he had to. Have you had an animal friend who left his or her mark on your heart? So sorry for your great loss . . . I truly believe every much-loved pet touches our hearts in a special way. Oh so sorry. I have a group of furry friends I hope to see at the rainbow bridge myself. Watching my sweet 11 year old dog Gus get stiffer and slower just breaks my heart. I wish our pets could be with us much longer. Again, sorry for your loss. All of the dogs my family had were part of the family and when they died it was a very tough and sad time. RIP Jeff, Barney, Bethany, Hayley, JB, Riley, Archie and Coco. Yes some good memories for the most part. Jeff trapped a couple of cops in the house when we were away on vacation. Barney was a beagle mixed with a chihuahua so he'd bite you and then immediately apologize. The sad memory was Bethany because she was just a puppy and died because a jerk neighbor fed her bad meat. Only time I legitimately considered murder (I was a teenager at the time). Hayley and JB were at the same time and they were just a great pair of dogs. Riley lived the life of Riley and never met a gust of wind that she wouldn't bark at for daring to go past the window. Archie and Coco were my sisters dogs that we ended up with. The first day they moved in, I came home from work and they started barking at me like I was the intruder in THEIR house. I looked at them and in a tone that brooked no argument told them, "Hey, I live here! You're the guests". They shut right up after that. LOL! Archie was a big galoot and after he died, Coco ended up being attached to me. They were never allowed in my room but one day after Archie had died, fireworks were going off and Coco peaked in my open doorway (stopping without coming in because she wasn't allowed) and just looked at me with a "please comfort me" look. I said, "Okay, come on in," and from that point forward she stuck to me like glue. I was so sorry to hear of your loss. Tonka was clearly a great writer's dog: there at your feet when you're working, but also there when you need motivation to get up and move around in the real world. And I will remind you that Aussie rescue groups are still out there, with lots of beautiful dogs who need good homes. I've had so many dogs in my life. One was an Irish setter named Finnian, who roamed woods and fields with me when I was in college, and even appeared in a play I directed. 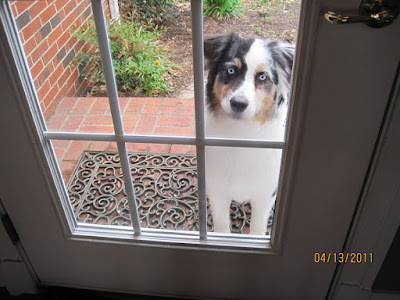 Many years later I found Liam, a border collie, by the side of the road--no tags, no chip, sick, hungry, and all worn out from being dumped in the country. I don't know how I would have survived losing my husband without him. Trying to find a new dog after Liam died, I connected to a border collie rescue group and fostered for them for two years. Which is pretty much how I wound up with the four excellent dogs who run my household now: Tam, Chess, Zoe, and Kata. Watching their group dynamics from day to day is better than television. Gigi, did you keep every dog you fostered LOL? Love hearing about your guys. Oh, lord no. There was one year, at the peak of my involvement, when more than 20 dogs moved through this house on their way to forever homes somewhere else. I really only ever wanted two dogs, but Chess sneaked in under the radar, and Kata just . . . stayed. She has an amazing way of getting everyone to do what she wants without ever seeming to work at it. You could try fostering. Tell John they won't stay. See how that works. Lucy, would he be more amenable to a mini Aussie? Easier to travel with, etc. My friend has two and they are adorable. Ha Gigi, I don't think he'd fall for that. We'll wait a while and see what evolves. I've never been a much of a dog person--cats all the way. But border collies are funny! As a friend of mine who has two of them once remarked watching them racing around her yard--"Look at those fools--they think they need to herd the tulips in the spring!" Aw, so sorry about Tonka. I've never had a dog, but I have known and loved many cats throughout the years. I am so sorry about Tonka. 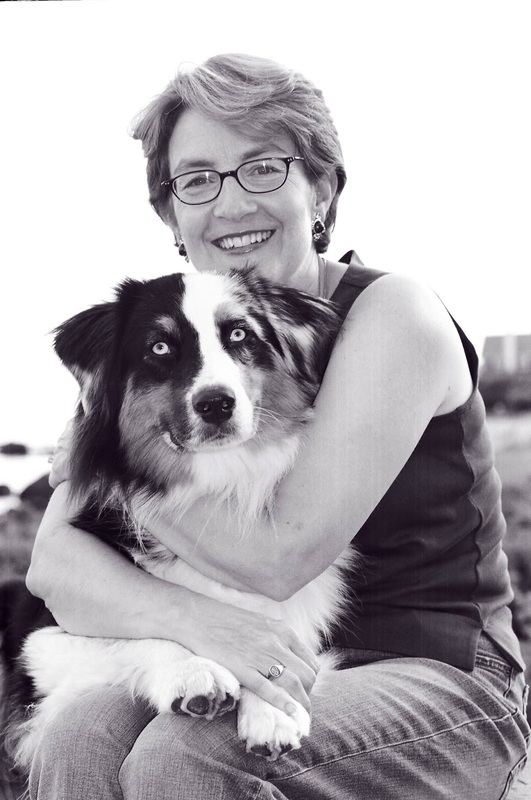 That was a great author photo. I had a dog named Marcie, a mutt who was half Boxer, half Lab, and half pit bull. She was a big goofy monster who loved everyone she met. In the mornings when I sat to write, she'd sprawl on the floor and rest her head on my foot. For years after she was gone, I could feel her phantom head on my foot. I'm so sorry, Roberta. I know how much you loved Tonka. I still miss my Birdy, who died a year ago. I got him as a fostered kitten, and even at fourteen he still acted like one - always fiercely curious and full of life. He lives on in my Country Store series, though, which is a treat. Oh Roberta, what heart ache. Our Toby is going on 13, and we know his time may be getting shorter, but there is nothing to do or say to make that easier. Losing a loved pet leaves a hole in your life. So sorry about this sad loss. Love the photos and memories. I'm so sorry for your loss, Roberta. It's so hard when our furry buddies have to leave us. I'm sure dogs have souls, if only because we give them a piece of our own. Big hugs to you. I am pretty sure they come with souls Cathy! You all are making me cry into my coffee. thanks so very much for the kindness and for sharing memories of your special furry friends. Roberta, you aren't the only one with tears in your eyes. What great photos! Easy to see how much Tonka was loved AND what a happy dog he was! We had a lab/shepherd mutt when I was a kid. With 8 kids, he was a buddy to all--no special person for him--he was like another goofy brother. When he went, kids everywhere crying buckets of tears. So glad you were able to give your Tonka a home--he was a beautiful boy! thanks Flora. 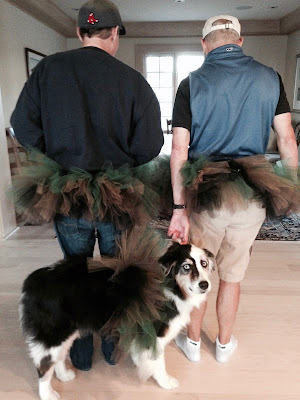 Dogs are so funny--Tonka was all about me, while our previous Aussie was more independent. And sounds like your guy was one of the pack--love that too! Toby was our first standard poodle, and what my mother called "a character and a half." So many exploits. And a regular on the cross-country and soccer circuits. He lives on in my stories and book as Tib. I am so sorry for your loss of Tonka. I am pretty sure I know how you feel. 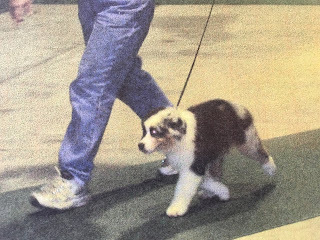 I once had a Sheltie we named Buddy, who then became St. Buddy for obvious reasons. His coloring was very similar to Tonka's and he had a watch eye. Couldn't ask for a better dog! A few months after we let him go my then husband and I were on a flight to Florida. There was a lot of trouble with the plane and we had make and unexpected landing and then catch a different plane to Chicago before we could reach our destination. My gloom and doom husband was convinced we were all going to die. That was the only time I truly didn't care because I knew I would see Buddy again. Our precious pets break our hearts but we wouldn't have it any other way. Losing a pet is heart-breaking, but not as heart-breaking as never having one. My sympathies to you and the rest of Tonka's family. Such a good good job. And a very lucky one, too. Imagine how he loved you both, and relied on you. I had my cat Lola for 20 years, and I still dream about her. She talks to me in my dreams, and it all seems very reasonable. It always feels like the universe has a little hole in it now, but I am grateful for our time, and hope you come to feel the same way. Someone once told me Lola had decided it was okay to leave, because she knew I would be fine. Thinking of you, dear Lucy. No more dogs. We'll see... Ah, yes. Famous last words. My husband and I said that after the loss of our beloved Toby. Eight months later, while scrolling through a friend's FB posts that was filled with dogs in Miami needing adoption, one photo grabbed my heart. She was to be put down at noon that day. It was 9:00 when I saw the photo. After 2 1/2 hectic, frantic hours my friend was able to rescue her and have her placed safely. Two weeks later, Maggie was home with us, all the way from Miami, FL to PA. This December it'll be 6 years. I am so sorry for your loss of Tonka. I love the photos of him. Paula, what a great story. I wish you could post a picture for us! You killed me. I liked that he confused me with you towards the end of his life. Loved him. Oh, Lucy, I'm so sorry. Losing a furry family member is always sad. Tonka was a gorgeous creature and clearly well loved. Thanks for telling us his story. With me, it's always been cats. I thought I'd never love another cat as I had loved my first one, Bounty. He was with me for just over 18 years. But then Blanco (yes, a white cat) found his way into our backyard and then our hearts. He was our first stray - such a wonderful experience to gain the trust of a frightened animal. After Blanco, I said no more cats; that's it. Ha! I lasted six weeks, then we got Holly and Lewis. Sadly, Lewis - always foolish around cars - was hit and killed, but Holly is still enlivening our days ten years later. Kay, who said that? it's wonderful. that is so fabulous, thank you! It is an anonymous quote, but they have plaques and all sorts of things that have that on it. It makes perfect sense to me and I pray it will happen. I think the loss of a one in a million dog takes up an even bigger part of our hearts. Deara Lucy, I'm so sorry for you. Up until a few years ago I might not have been able to relate to your lose. I was a cat person. Then my son acquired a rescue dog, Tesla. We now share her. She stays with me when he travels and now I take her occasionally for "just because" visits. You are right. There is nothing quite so loving and supportive as having her either wrapped around the base of my chair or firmly lodged under my desk when I'm working. I'm so happy there is a "we'll see" in you future. And, great photos. thank you Lyda, glad Tesla has come into your life! My heart breaks for you. I am so sorry. I lost my 15 yr old kitty in January. She was am amazing companion. Currently I have my 18 mo. Goldendoodle, Ginger Snap. She cheers me up with her antics. I have lost many furbabies over the years and hope to see them on the other side of that beautiful rainbow bridge. Much love to you! thanks so much Celia, Aussies are really special--and so much work! What a wonderful tribute. I can tell how much love and joy he brought to your lives. My Scout, gone five years now, did the same. Hugs to you. Lucy, I'm so glad I got to meet Tonka. He was an enchanter, all right. So beautiful, so special. But I didn't know his history and hadn't seen his puppy photos. I am so sorry for your loss. We know the deal going in, but it never makes it any easier. And I can't imagine being dogless, although I never had a dog that was really my own until I was grown and married with a child. My ex hubby brought home a six week old cocker spaniel puppy as a surprise for Kayti and me. We named him Taffy, and he was my beloved companion for nine years. He got me through a debilitating illness. (I was having terrible rotational vertigo in those days, before my shunt surgery. Taffy could somehow sense when an attack was coming. When I went down, he would stay beside me, pressed up against me until I could get up again, which was often hours.) He also got me through a hard separation and divorce, and he left us much too soon. Hallie, our first German shepherd, was the dog of my husband's heart, as Taffy was mine. She lived to fourteen, and six years later, we still talk about her all the time. Our dogs now are four and six, and I remind myself to treasure the days. He's beautiful, Lucy. And I can assure you that there is a Rainbow Bridge. I have been, but it wasn't my time. that's a story that needs to be told Kait! Not much to it. In 1992 I had surgery and died on the operating table. I have a clear recollection of watching crash carts and paddles from above and then flowing through space and emerging in what looked more like a meadow than anything else. Georgie (my first pet, a guinea pig), Jinx, and Quiller (my cats) were both there, all of my friends and relatives who had passed before, and oddly, my Aunt Nellie. I'd spoken to her before I went into the hospital. It was a happy, peaceful, place. Everyone was talking all at once, but somehow each conversation was discrete and easily understood. My critters were at my side playing, Jinx on my shoulder where he often was during life. No wings or clouds, but it was clear that this was an entry place. One of my best friends from high school, Blanche, murdered on New Year's eve 1978 by a disgruntled boyfriend, convinced me to come back, that it wasn't time - Blannie, you have a lot to answer for - you sent me back to a world of hurt! - I came back. At first convinced the entire experience was bogus, some strange dream. My Aunt Nellie was quite alive. My first phone call when I was released was to my cousin who lived next door to my aunt. My Aunt Nellie had died the night before my surgery. The rainbow bridge exists, maybe not as a rainbow bridge, but our loved ones are waiting for us. All our loved ones. Hugs to you. We have a wonderful Pug, Pep, who has been with us since he was 8 weeks old and will be 16 in September. Lots and lots and lots of health problems but still the same old strong, loving spirit. We are watching closely to make sure we don't allow him to be in pain. Not sure we can prepare, but trying. Dogs bring so much to our lives, don't they? We tried to do the same thing, watch him for signs that it was time to get over ourselves and let him go. There's no perfect answer sadly. Good luck with Pep--he sounds like a gem! So sorry Roberta and John. Writing group will not be the same. RIP my little buddy. Roberta, I am so sorry for your loss. I completely understand. We have had many dogs and cats while growing up. The best cat I ever had was named General, and he is always in my heart. General is the perfect name for a cat! I adored Tonka. I'd sit down at your house and there he'd be, at my feet, sitting back on his haunches with his chin on my knee, noodging and noodging to be pet. Alert to every nuance. Hard to imagine coming into your house and not hearing that thumpety thump down your back stairs. Once upon a time when Jerry and I were just married and living in NYC, we had a wonderful cat named Eloise. Cantankerous to everyone but us. I'd be opening the door and he'd (it was a he) meowing from the other side of the door. I'd come in, bend down to pet him, and he'd leap up on my shoulder, press his nose into my ear, and purr. Sadly I got sick (asthma, allergy) and had go give him away. I am still mourning my border terrier mix, Boo. He was one of a kind. His death was eased a little bit by Jack, my f-i-l's Jack Russell mix that I had originally adopted for him. We got him back when my f-I-l died. Jack is definitely my husband's dog; he imprinted on the men in the family. I have loved all our dogs, but when they pass, it seems my mourning period gets longer each time. And I say every time that I'm not doing this again. And then I do. But when Jack goes (he is a very healthy 11) I may not do it again. My heartfelt condolences to you and John. Princess Diana, he'd like that analogy. I hope the new dog is settling in well. So sorry for your loss. Every one of my beloved pets have left a mark on my heart. Lucy, your beautiful author photo with Tonka says it all....what a presence he had! I am so sad for you that it was his time to leave after such a good life. thanks Helen, he sure had a presence. Each one of these special beings take a piece of our hearts when they leave. BUT they have enlarged our hearts in the meantime. I’m so sorry for your loss. It’s so hard to give up our fur babies! Although I’ve loved every dog I’ve had, my Golden Retriever, Brittany, is the one I’ve missed the most. She was a rescue and I had her for 13 years. She was the sweetest dog and did everything with me. It was 3 years before I could think about another dog. Sending you hugs, Lucy. Losing a cherished pet can be heartbreaking. I'm so sorry for your loss! It's so hard to say goodbye to our furrbabies, but our lives would not be complete having never known them. So sorry for your loss, Lucy. The pain is real and takes a log time to heal. I'm glad you have lots of pictures, though it may be painful to look at them now. Yes, it would be great if they could live as long as us, but think: if they did you wouldn't have had Tonka because Poco would be ancient but there. Each dog has his day. Thank God for it. that's true Rick, and it wouldn't be fair if they outlasted the person they loved. Oh Lucy, I've been gone all day, and so I'm just seeing your post here. I'm so sorry about Tonka. I loved seeing the pictures of him in Key West, in costume or just his plain beautiful self. I know you will miss him terribly, but you and John allowed him to live a wonderful life, and that's as good as it gets. Before we had children, we had a Cocker Spaniel named Barry. When Barry died unexpectedly, I mourned to the point of not being able to eat. He was our baby before we had babies, and he will always hold a special place in our hearts. Two dogs followed, Fella and Abbie, and of both of those losses were hard, too. 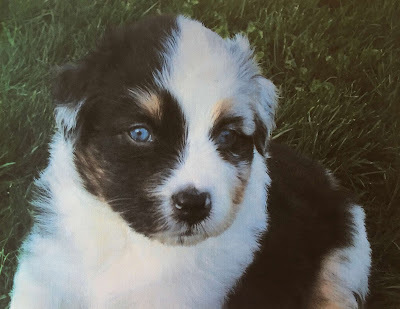 We haven't had a dog for three years now, but we have started looking again and hope to have a sweet doggie in our lives soon. I'm so sorry for your loss, Roberta. I have cats I still mourn the loss of--Kermit and Zelda--just nutty little short hairs. Toshi the Siamese--lived 20 years. Hated everyone but me, men especially. But, it seems we are all sitting Shiva for Tonka here, quietly, making a few remarks. And, although it is not the nicest poem about a pet (although one of the funniest!) I'll quote the last two lines from Billy Collins' poem The Revenant, about a dog speaking from heaven: "That everyone here can read and write, the dogs in poetry; the cats and all the others in prose." thanks Melanie, that made me laugh. I'll have to go look up the whole thing. I wonder if your wonderful cats would have agreed? Oh, I'm so sorry. We said goodbye to our Nick two weeks ago, the day after his 15th birthday. I'm still listening for him, missing him, just as I miss his three siblings whose lives were shorter. What I've learned as I've mourned and loved and remembered those four dear ones and the ones who went before them is what individuals they are. I miss each of them for such distinct reasons. There are moments and days when I simply miss Teddy or Mavis or Nanny for something about that dog--I miss him or her, that individual, the way I miss my mom or my dad, not just "a parent". They will always be part of our family, and my relationship with them continues on. And the only comfort I've ever found in wondering why their lives are so much shorter than ours? How much worse would it be if it were they who were constantly being left behind due to our deaths? As incomprehensible as it is for me now, I can't imagine leaving them alone. We can at least try to make sense of it. yes that's just what I was thinking. Tonka HATED me to go anywhere, though he did a good job of latching on to whoever we left him with. And making them feel like they were IT. Lucy, I am so sorry for your loss. When a pet is as integrated into your life as Tonka was, it's a very deep loss indeed. For anyone here feeling this pain and looking for local resources, you could go to www.pet-loss.net and click on your state in the upper left corner. You'll see a list of local support groups, pet grief counselors, etc. I also wrote a book on this topic under another name, Joy Davy. The book is on Amazon, "Healing Circles." Personally, we have 5 little rescue dogs and one rescue cat, and they drive us crazy but at the same time, make life rich for us. Each one has an issue: ankle-biting is Teddy Bear's problem, and we've been working on that for 10 years now. Yet he is my husband's pride and joy. I appreciate your posting about Tonka. What a beautiful and devoted dog! Lucy, I know firsthand how much it hurts to lose a beloved pet. I've had 4 dogs cross the rainbow bridge, and yes, I believe there is one. Sharing this on the Pens, Paws and Claws FB page. Bobbie - Very nice memorial to a great friend. You certainly have my sympathy. I lost my pal "Ruby - the wonder dog" in June 2017 and not sure I could stand it again, so haven't got another dog. Diane keeps hinting, but maybe later. She was pretty near perfect, like Tonka. But she was terrified of thunder and it kept getting worse, including wind and even drops in barometric pressure. Thunder shirt didn't work, doggy valium did, but it was a hassle. She went quick, apparently had a undiagnosed tumor inside which burst. Not unusual I guess. She was a 12-yr old lab mix and about the sweetest dog ever.